Why Elected Officials Can’t Craft Their Own Job Descriptions. Because we’re paying close attention to the Charter and Code right now, here is an example of how not to go about updating an elected official’s job description. Recently (maybe even this past week) the Mayor’s office generated a definition of the Mayor’s role and posted it on the City of Kingston’s website. We’re all for updating job descriptions of our elected officials, but there are some glaring problems here that the public should understand. By having a better sense of these processes, the people can take control of what is theirs – that being city government and how Kingston is managed. 1. HOW DOES THE MAYOR’S NEW DESCRIPTION RELATE TO THE CHARTER and/or CODE? The Mayor’s text is not what is written in the charter – and based on what he has crafted, one would need to carefully cross reference as to how it relates to aspects of the code. Take for example his description, “The City Charter names the Mayor as President of the Police, Fire, Public Works and Water Boards“. Here’s the tricky part. If you look at the administrative code online, it looks to be so. 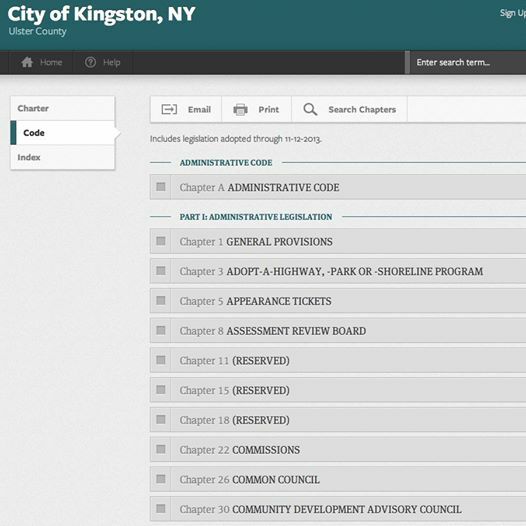 However, acccording to this DOCUMENT also provided on the city of Kingston, NY’s website (but not reflected in the code), it shows that in fact the President of the Board of Water Commissioners since 2012 as being Joseph DeCicco and not the Mayor of Kingston. Why is this important? When an elected official of the highest office doesn’t himself know how the city’s framework is structured, then how would the average citizen? That said, to everyone’s defense – if the code online isn’t up-to-date, then there isn’t any way of knowing unless you are a sleuth like me. The charter is the law. Text is….well, text. Do we think the description in the charter is light? Absolutely. Are we concerned that the code online may not be up-to-date to keep up with the changes that occur from year to year? Even more so. We support an update of it all for elected city positions so that they are more current and detailed – but done so in the proper manner. 2. THE PROCESS IN UPDATING THE CHARTER. To undergo Charter revisions is a process that requires a commission, public hearings, a council vote and then a referendum on the general election ballot. The Code, along with the Charter, would have to also be addressed. Code is the “…official collection or compendium of laws, rules or regulations of the city consolidated and classified according to subject matter.” Code, therefore, is constantly changing and should be updated on a regular basis for the sake of clarity and transparency. Unfortunately, I don’t think Kingston’s code is kept current online – and that’s a very large problem that should be addressed by the council immediately. You’ll notice at the top of this post the history of when the Charter was amended. First in 1896 and then not taken back up until 1993 with further amendments in 1994. In 1993, a commission of volunteers led by Tom Benton worked hard for two years to update the charter in its entirety, ushering in a City Manager form of government. It went to a referendum and passed by hundreds of votes – a big deal in Kingston. But City Manager was not something that then Mayor T. R. Gallo supported. So in 1994, we’re told that a lawyer out of Poughkeepsie, NY was hired and replaced the term ‘City Manager’ with ‘Mayor’. The amended document was brought to a new commission that this time, Gallo as Mayor selected who reversed City Manager to a Strong Mayor form of government. This all went down in a five minute meeting with a unanimous vote in favor. That’s stunning. With an election just around the corner, they had little time to get it on the ballot as a referendum. A public hearing was organized within a two week window following the commission meeting, then swiftly moved through council. The newly amended charter was placed on the ballot where the referendum passed by a slim margin. Can you imagine the way the volunteers felt, who put so much into this process with thousands of hours of research and public outreach? Here’s hoping that history will teach us something. READ Tom Benton’s account in a commentary written for the Kingston Times. 3. ELECTED OFFICIALS CAN’T CRAFT THEIR JOB DESCRIPTIONS. Although it would be convenient, elected officials can’t write their job descriptions as law for reasons stated above. Important processes such as this are very public ones. KingstonCitizens.org will host a second educational forum at the end of April to discuss the in’s and out’s of the Kingston, NY City Charter and Code. Keeping it clean. Who is KC.org and What Are We Doing? Government needs to manage government… either the county level or the state level or the district attorney… these irregularities precede Gallo, not to mention the terrible communication to the citizens: that borders on embraced tradition. You’re being a sleuth is great, and incredibly unusual… and with all the work you do in gathering and organizing and editing, it’s not an easy read… the information is technical and requires precision. How about a citizens council… built around kingstoncitizens.org, of course: the structure is already there. But you’re going to have to ask, invite, choose, expect participation and support. And you need staff you can delegate too… in the manner that the strong mayor position may, at the end, simply have inefficiency as its biggest flaw, sole proprietorship in civic information may be fatally inefficient, IF Stone, Bill Moyers, et al, notwithstanding..
And while I dearly wish the city to improve communications and key citizen involvement, while the mayor is in office I am inclined to support in and help him and cheer him on in those things he has chosen to do, and to see that he does that well. And I admire his energy and hard work and affection for the city. (Things that get in his way by his adversaries or by his own hand, I am really sorry for.) That citizens group is a friend of government, a friend of office holders, in that critical intersection of public interest in the quality of local government: whatever else a city does or does not have, it will not thrive absent good government. Again: what state agencies ought to take note? or be proactive? And where does Holly Carnright fit in, or not. We’re all for supporting our public and appointed officials – but we all must be inclined to be current with what’s going on, and in some cases – be ready to make necessary changes. I don’t think government ‘needs’ to manage itself. Perhaps I’m old fashioned, but I thought that it was a collaboration that begins (and ends) with the voice of the people. Glad that KC.org is back. It feels good to do this work – and as always, I invite citizens to participate here. I am always happy to have coffee with anyone with ideas or ways that they might wish to become involved. I also would like very much to encourage others to write and submit pieces for KC.org. It would be great to have more voices here. It was that great question in Ghostbusters…. Do we need the name of a lawyer who can be retained for such civic matters?